The new farming blocks consisting of one million hectares of land created by the Zambian government represent a unique investment opportunity in the agricultural sector says Agriculture Minister Dora Siliya. Ms. Siliya says the initiative will lead to the creation of new agricultural towns in which agribusiness that consist of value addition, processing, packaging, exports and other logistics will emerge. Speaking in Berlin, Germany where she is attending the 10th Global Forum for Food and Agriculture, GFFA, Ms Siliya says the farming blocks will also lead to investment in infrastructure that support agriculture such as roads, new housing, schools, energy, hospitals, and police stations among others. “This is the product we have come to sell here”, says the Agriculture Minister who is also Petauke Member of Parliament. In addition, the Minister says the farming blocks have also presented another investment opportunity in the Information and Communication Technology, ICT, sector. “For the first time in the 2017/2018 agricultural season, we have gone 100% e-voucher creating an electronic database”, says Ms. Siliya. The system allows for the allocation of farming inputs to deserving famers electronically and accessed within their areas of operation reducing on paper work that in the past led to delays in the distribution of fertilizers. “But there are many backward and forward linkages that still need to be created such as ICT applications, ICT platforms linking the farmer to commodity trading, to markets, to price discovery, and to the financial sector such as the financial products available to the farmer”, says the Minister. Ms. Siliya says these are opportunities especially for young people in which they could partner with government, the farmers, the banking community and agro dealers in the provision of ICTs and smoothen the interface with the farmer who is at the center of this ecosystem making it as seamless as possible. During the 3-day conference, the Zambian Agriculture Minister says she will particularly be speaking to the private sector that she wants to see invest in the production of fertilizers which currently the Zambian government has to import. Furthermore, Ms. Siliya says she will be speaking to them regarding the opportunity that lies in the manufacture of equipment such as “the small tillers, the small planters, and pesticides”. In the area of value addition, the Minister says, “beyond the farm gate, we want those that can turn Zambian mangoes into mango juice, package Zambian chili for export, Zambian cassava into starch for export, our cotton into lint, create industries around our beef, our fish so that more jobs are created in our country”. “And attending international conferences such as the GFFA provides us with an opportunity to tell the world that we are ready and open for business in the agricultural sector”, says Ms. Siliya. 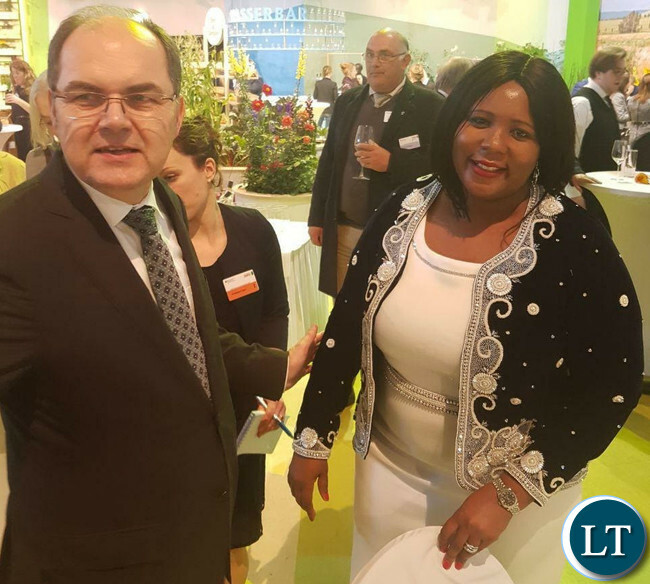 And Zambia’s ambassador to Germany Anthony Mukwisa says the presence of the Minister at the GFFA is testimony of President Lungu’s determination at diversifying the economy and reduce its heavy dependence on copper as its main stay of the economy. The GFFA brings annually leaders from politics, business, science, civil society and academy to exchange knowledge and experiences related to the global agri-food industry. It is organized by the Federal Ministry of Food, Agriculture and Consumer Protection (BMEL) in cooperation with GFFA Berlin e. V., the Senate of Berlin and Messe Berlin GmbH. She is right isnt she? Because of what has been said above I’ll say that Dora is the best Minister Zambia has ever had and what she is doing right now ins correct. Except for the word “Agriculture,” which she probably learnt in a dictionary, I am not sure what else Dora Siliya knows about agriculture. Any wonder the Lungu regime has even started harvesting mukula trees for export! This girl went to Roma girls secondary School. And never even watered flowers in her life, and you put her in charge of mature. What an insult to us who did Agric in school. Hilarious isn’t? That’s exactly what I am saying @1.3. A fair appraisal. Have performance standards tumbled under PF, I wonder? @Norstradamus, You went on to do Agric as a last resort right? I know you wont accept you will tell us that “no even from school I did agric and that was my passion” aahhhh! wenyeeee! @ Mange ta Munya Upa. I was cautious with my appraisal because of a risk of being called an !diot or walking myself in the !diocy domain. Just a reminder to all tribalists below. Agriculture is not just about ploughing the land and planting maize. It’s an umbrella term that harnesses a lot of activities. There’s agri business and economics envolved to mention a few. What makes mundia sikatana a lawyer more suitable as minister for agriculture than Dora a holder of MBA. A minister is simply a policy driver. Technocrats are there in the ministry who run the day to day of agriculture as a whole. Politicians are policy drivers only to see to it that the ministry is working in line the party manifesto. Abenangumbo kalaba aliletele akantu ku bwinangumbo alale. Endesyeni ba wesu kachilikachelo. Back to the topic at hand, one of the greatest thing Dora will be remembered for is the revamping and creation of agro-processing mechanisms in our economy. The other thing is her push for farming blocks, leading to the FM (farm to market) road system. Fwe bena Luapula ntondo will fully take advantage of this and turn our home province into a new industrial hub. Ministry of Agriculture is not easy to run, and by any standards this lady has done tremendously well. I remember in MMD years, this Ministry was described as a “Bottomless Pit” Dora has performed much better than all the Agriculture Ministers of MMD and PF era. She may have made mistakes here and there but she’s handling it. Of course Mutati is helping her, but she must be commended for job well done. Bashi Nono, Lubinda etc etc., they all failed in this Ministry. Considering the armyworm crisis and the late distribution of inputs in the current farming season, what are the praiseworthy successes she has scored that you are referring to? I’m comparing her performance to others. Tell that to a group of farmers and you will wake up on ICU. Lombe, you are definitely intoxicated with some kind of bannes coolaid. Mundia ‘bumper harvest’ presided over Zambia’s latest bumper harvest under the MMD and Mwanawasa. Even Lubinda delivered a bumper surplus that Dora exported to Malawi and misappropriated the proceeds and became a ‘Malawi maizegate’ scandal where ministers there lost their jobs while we had cover-up here. I also tend to remember bumper harvest and surplus under MMD where Edith Nawakwi was implicated in the illegal exportbot maize to Zaire and Moses Katumbi. Zambia has performed better in the past but the then Food Reserve Agency mismanaged the surplus storage and exports. … this woman you are praising is incompetent and has never been successful in any ministry that she has headed. Just scandal after scandal. Get real mate! Guys this is a serious matter. We cannot allow this ignorant woman that has been appointed to such an important ministry to be exposing Zambia’s God given land secrets laden with all sorts of minerals to sell to the outside world, just because she and her bosses need kickbacks? So True. Focus should be on getting citizens to be more involved in matters of national development than selling our country to foreigners. The picture we are portraying is that we cant do anything as a people. Very soon, us Zambians will have room in our own countries. shouldn’t the government be encouraging organic farming instead of relying on chemical fertilisers? Organic produce fetches a higher premium so you could make more money for utilising smaller acreage. If there was an award for best minister Dora would win it, she’s just perfect for every ministerial position she’s appointed. Great work Dora. She’s got big nice legs. No wonder RB could not resist and thereto Lungu accepted her. She offers to these Presidents. Unfortunately, she urinates on bed especially when drunk. so be careful. She will wee on all fertilisers and there will be no food in Zambia. Presently, Dora is the only Minister with brains. Look! the way she has articulated the policy direction on value addition. The only way to reduce postharvest losses is to transform agricultural produce into shelf stable, value-added products for increased income and wealth creation. Nevertheless, She is failed by technocrats deficient in knowledge to undertake such transformation. Dora is smart, very educated and hands-on approach! she needs to join lungu and them doing yoga and a bit of jogging. Just good for animal behavior and not farming ministry! LT – Where is this 1 million hectare farming block located? No secrets. Whose land is being offered? I hope it is not land owned by politicians. The voluptuous size of Dora amidst so much poverty induced by govt belt tightening policies is shameful. Imagine what the tips the scale at, ni “Hafu Njovu”. This is typical visionless stuff from neoliberal politicians. What interest is it for the local people to ‘attract foreign investors’ when she should be developing these ‘farming blocks’ for local Zambians. They themselves should be using revenues from copper or the eurobonds to invest themselves. They don’t need anyone to hold their hand to collect land rent, and recover their investment that way. Believing in ‘market based solutions’ means all these politicians need to do is collect a cheque. More must be done to inspire the citizens to do participate in national development than wooing foreign investors. The future of our country looks dreary. Our leaders are selling out our country at a give away price. so sad.